WASHINGTON — Senate Democrats last week blocked action on a bill that would deny some federal funding from cities that shield residents from federal immigration officials. Republicans, including Donald Trump, have rallied behind denying federal assistance to so-called “Sanctuary Cities” since July when a Mexican immigrant shot to death a woman in San Francisco. The city had previously declined to help Immigration and Customs Enforcement officials seeking to deport the immigrant over a recent drug conviction. Democrats, including President Barack Obama, opposed penalizing cities such as San Francisco, saying it would make their streets less safe by taking away federal funding and discouraging people in the country illegally from reporting crimes. The bill, introduced by Sen. David Vitter, R-La., failed on a procedural vote where 60 votes were needed to move forward. The vote was 54-45 with Sen. Mark Kirk, R-Ill., joining every Democrat in opposition. 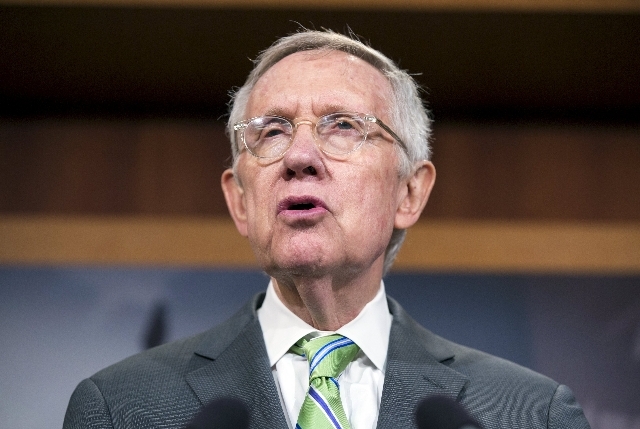 Senate Minority Leader Harry Reid, D-Nev., slammed the proposal as vile. “Similar to the disgusting and outrageous language championed by Donald Trump, this legislation paints all immigrants as criminals and rapists. At its core, Sen. Vitter’s bill undermines the ability of local law enforcement officials to police their own communities and ensure public safety,” he said. Vitter, who is running for governor of Louisiana, argued the bill is needed to keep Americans safe by making sure cities enforce current immigration laws. “I refuse to simply stand by and reward jurisdictions around the country with federal funding — taxpayer funds — when they are in clear violation of the law and are actively making our communities more dangerous rather than safer,” he said. Reid voted against the bill. Sen. Dean Heller, R-Nev., voted for it. The House, largely along party lines, approved legislation to speed regulatory approval of mining operations for gold, silver, copper and other “strategic and critical” minerals. Rep. Mark Amodei, R-Nev., who introduced the bill, said a 30-month time limit on the approval process as well as limits on judicial review are needed to ensure that new mining operations can get to work providing a domestic source of minerals that are needed for everything from computer chips to concrete. The bill is strongly opposed by the Obama administration, which issued a statement earlier this week saying it would undermine sound federal decision-making by eliminating appropriate reviews under the National Environmental Policy Act. The administration also said it opposes the bill’s severe restrictions on judicial review. Rep. Dan Newhouse, R-Wash., spoke in favor of the bill, saying “onerous government red tape and frivolous lawsuits” were moving good paying jobs overseas and putting domestic manufacturers at the mercy of foreign competitors. Rep. Jared Polis, D-Colo., argued that the bill was so broadly worded that any mineral would be considered “strategic and critical,” allowing sand and clay miners the ability to circumvent required public health and environmental review processes. The result, he said, could damage the economy by placing mining interests on public lands ahead of other interests such as hunting, fishing and skiing. The bill was approved, 254-177. Joining Amodei in support were Reps. Joe Heck and Cresent Hardy, both R-Nev., and Dina Titus, D-Nev. The House voted to scrap parts of Obama’s signature health care law as well as strip Planned Parenthood of federal funding for the next year using a “reconciliation package” that would allow the measure to clear the Senate by a simple majority rather than a 60-vote majority needed for most legislation. “I’m saddened that reconciliation is a word that folks have to go and look up and learn, but it is the only way, the only way in divided government that the people’s voice can be heard,” said Rep. Rob Woodall, R-Ga. The bill would eliminate requirements for all Americans to obtain health insurance and for employers to offer it to their workers. It also would end a tax on medical devices. But, the bill would leave in place health exchange subsidies and federal subsidies to states that expanded Medicaid entitlements. The White House has threatened a veto. Senate Majority Leader Mitch McConnell, R-Ky., has indicated support for bringing the bill to a vote but passage is not certain despite a 54-vote Republican majority. Several conservatives in the Senate have voiced concerns that it fails to go far enough in repealing Obamacare and at least one Republican opposes defunding Planned Parenthood. The House vote was 240-189 in favor of the bill. Heck, Hardy and Amodei supported it. Titus opposed it. Contact Peter Urban at purban@reviewjournal.com or at 202-783-1760. Find him on Twitter: @PUrbanDC.